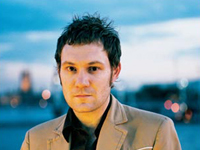 British singer-songwriter David Gray had released three overlooked albums by the time White Ladder and its international hit single, Babylon brought his mix of acoustic instrumentation and electronic samples to the mainstream. Born in Manchester in 1968, Gray relocated to Wales at the age of nine before returning home to attend the University of Liverpool. While in school, he dabbled in several punk bands and began exploring new styles of writing, eventually uncovering his own poetic penmanship. Following a move to London, Gray signed to Hut Records in the United Kingdom and Caroline Records in the United States, releasing the single Birds Without Wings in 1992. The next year saw the release of his folksy full-length debut, A Century Ends. Through his emotional tales of passion, love, and solitude, Gray’s trademark style of fiery intensity countered with tender poignancy started to find an audience, particularly in Ireland. However, despite frequent solo tours (as well as an opening slot for Shawn Colvin), Gray’s edgy sophomore effort, Flesh, was released in 1994 to an underwhelming response, and he was subsequently dropped from his label. Gray was now an independent artist, but EMI Records noted the singer’s potential and quickly signed him to a new deal. Meanwhile, the buzz in Ireland continued to build thanks to No Disco, an alternative music video program that showcased Gray every chance it got. Hanging on to that thread, Sell, Sell, Sell arrived in 1996 in limited quantities. Gray hitched up his touring boots and hit the road again, this time opening for such heavy hitters as Radiohead and Dave Matthews Band, but a lack of mainstream response resulted in Gray’s split from EMI. Recapturing and embracing his independence, the musician self-financed his fourth album, White Ladder, and released the album on his own IHT Records in 1998. Recorded in a London apartment with an easy blend of samplers and acoustic guitar, White Ladder was a sublime leap forward for the underappreciated Gray. Ireland certainly recognized its merit, as the record immediately climbed into the Irish Top 30. Gray found other outlets as well, offering five tunes (including the elegiac title track) to the soundtrack of This Year’s Love. The good fortune continued as former road pal Dave Matthews (who had taken a liking to Gray during their shared tour) made White Ladder the first release on his own ATO Records imprint in 2000. Boosted by this additional release, “Babylon” enjoyed a positive reception in the U.S. and peaked at number five on the U.K. charts. Its success coincided with Gray’s performance on the main stage at Glastonbury, and White Ladder went on to enjoy multi-platinum sales.